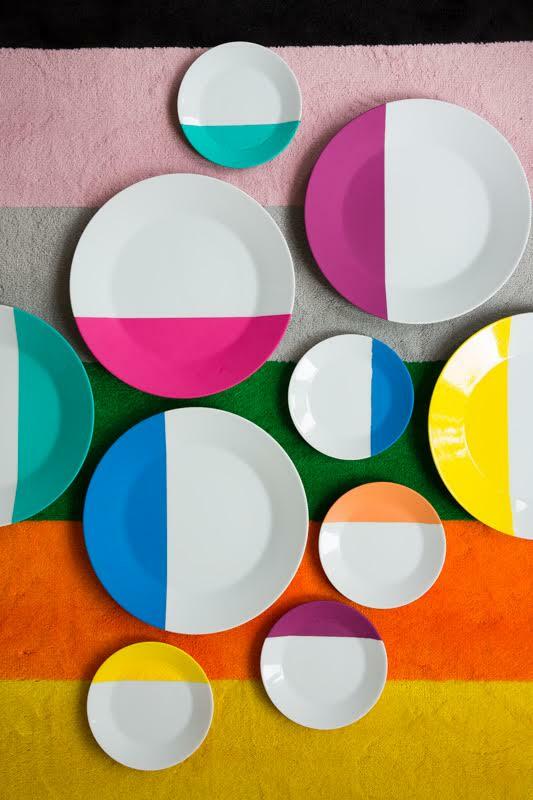 With some plain white china, emulsion and masking tape you can create designer plates for next to nothing. 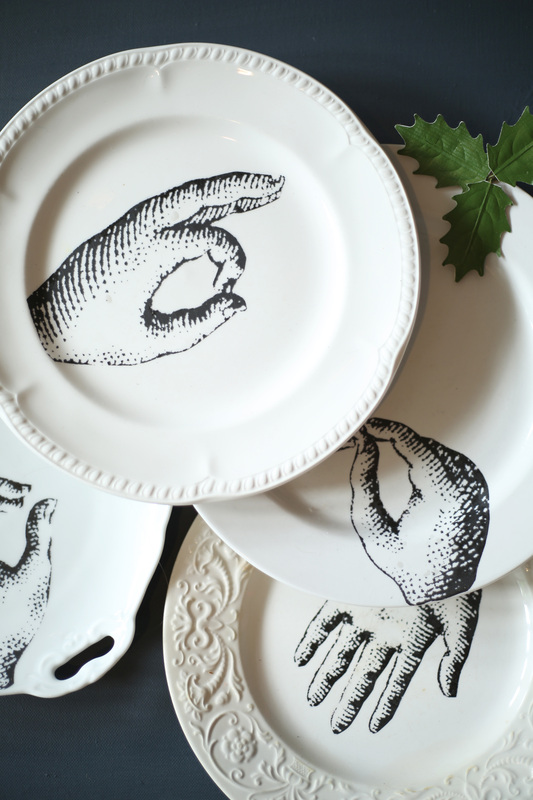 Please note these are purely decorative and cannot be used for eating from or put in a dishwasher. You will need some white China we used Ikea 365 costs £2 for a large plate and £1 for a small one, Crown paints match pot s£1.49 for 40ml we used the following colours: Blue Planet, Scrumptious,Orange Squash, Up beat, Shocking pink, Hot mustard. Masking tape and a car sponge. Stick the masking tape across the paint to make a line of where you want the colour to finish. Dip the sponge into the emulsion, and using an up and down motion, cover the area where you want to add colour. Build up in layers and leave to dry before removing the masking tape. Tip If you get smudges when you remove the tape, use a scalpel blade to remove the excess paint. 1. Cut the fabric to size. With the wrong side facing up, fold up 1.5cm on the long sides and the bottom edge and secure with iron-on tape. 2. Still with the wrong side facing you, turn the bottom edge up again by 3cm to create a channel for the dowelling. Iron in place with tape. 3. Measure 10cm in from each long edge at the top of the blind; this is where the ribbon will sit. Secure one long length to each of these points with staples, ensuring that half hangs over the front and half over the back. 4. 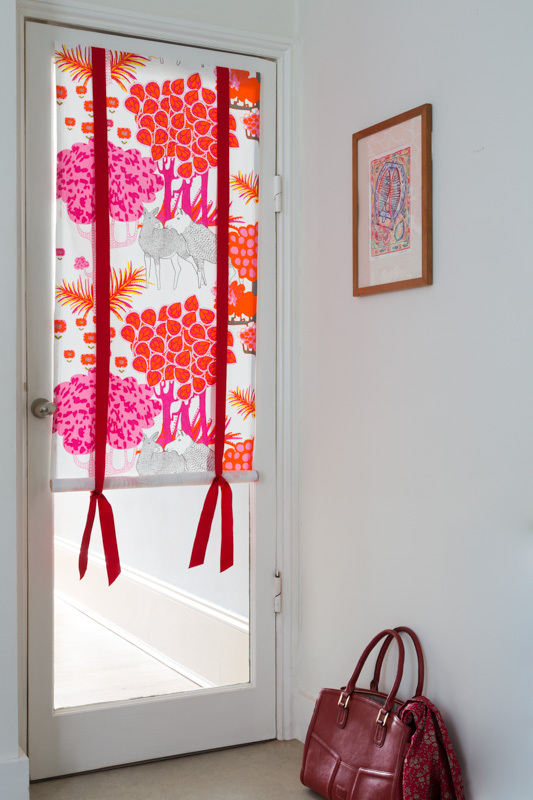 Staple the top of the blind to a strip of wood, then attach hooks for hanging. 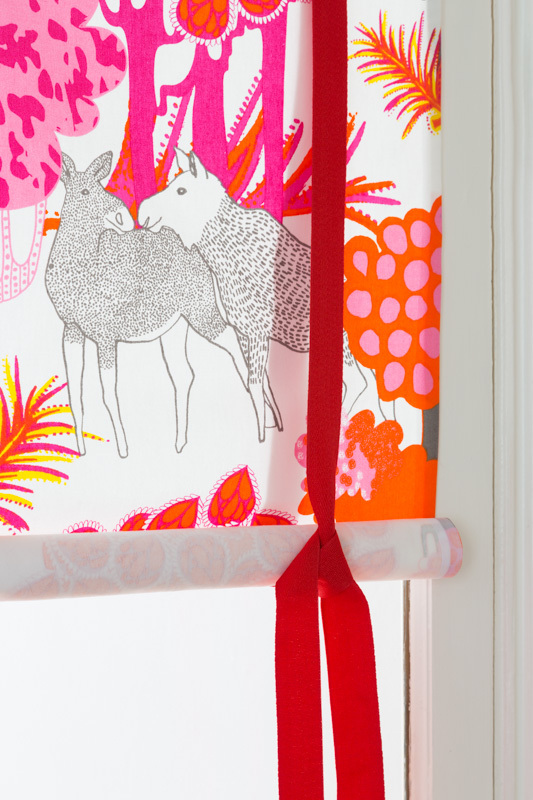 To pull up the blind simply roll the fabric to the top and tie in place. Who’d of thought charity shop find vintage plates could so easily be transformed into such elegant wall art. A really simple project, you will need an inkjet printer to make the transfer images. We found these gorgeous copyright free eighteenth century wood engraving designs for teaching hand language. Select the images you want to use. 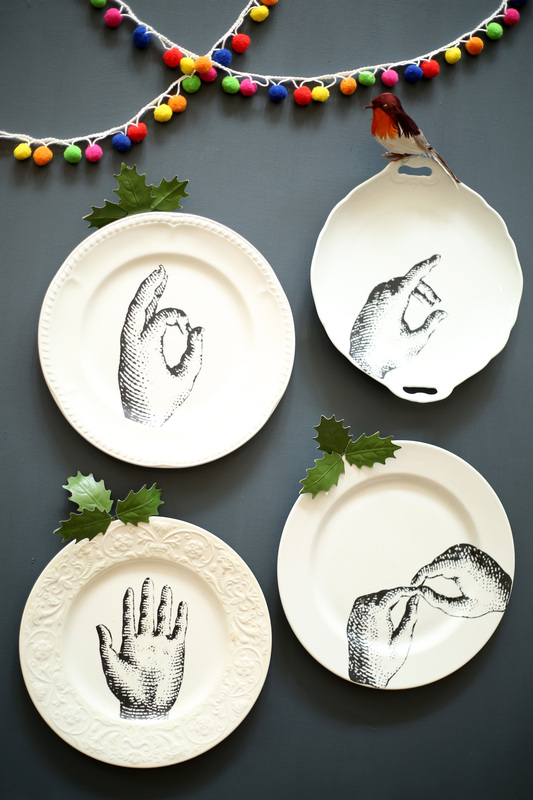 Print them out in a variety of sizes, cut out using scissors then try them for size on the plates. 2. Follow the manufacturer instructions print the images onto decal paper, then spray with acrylic varnish. Apply a couple of coats covering the printing completely to seal, so it doesn’t break up in the water. 3. When the images are completely dry, cut out with scissors keeping close to the edge of the design. To help the images slide onto the plates sponge on a thin layer of water. Put the paper backed image into a bowl of warm water, leave for about 30 secs. Lift the edge of the image off one corner of the paper. Hold the image over the plate, gently curl the backing paper away and slide the image onto the plate. Use the sponge to pat out any bubbles or wrinkles in the image. 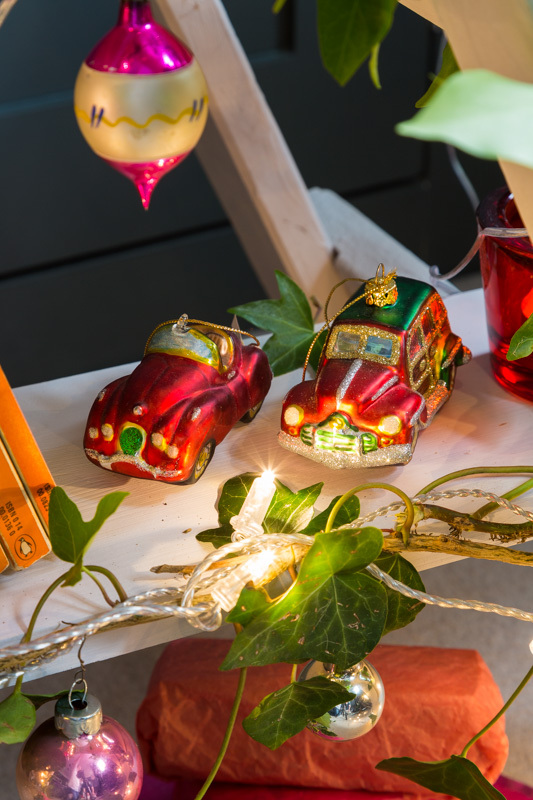 This nifty little project making Christmas decorations, is one for people who have pets using old pet food containers. We are talking about those lightweight aluminium ones with a lip round them. First cover the inside of the container with the paper face down. Draw around the edge with a pencil. Take a pencil and extend the sideline of the square. 2. Cut out the paper cross shape. Fold the side arms in to crease the paper. Paint the reverse of the paper with a layer of PVA glue, put the paper into the tray, press the two shorter sides onto the tray, then press out the long sides onto the sides. Along the top edge of the tray cut deep nicks in the paper and wrap the paper over the edge to stick in place. 3. To cover the outside of the tray, take a contrast printed paper. Paper face down draw around the base of the tray, cut out square shape. Measure around the outside of the tray, add 1cm for overlap. Cut a strip of paper the measured length and 3cm wide. Paint with PVA glue then wrap around the tray cutting long nicks in the paper to ease around the curved corners, press the loose strips into place on the base, then glue the square of paper over to cover. Poor glitter onto a plate, paint the front edge of the tray with PVA and dip in glitter. 4. To make the portraits, if you like use scissors to trim the top of the spoon into a hairstyle, then paint the spoons with a base coat of white acrylic paint. While they are drying make the shoulders for the portraits. Cut a strip of thin card slightly narrower than the opening of the tray and about 2cm high, fold in half along the length then glue on printed paper. 5. Use acrylic paint to mix a variety of skin tone colours, paint the spoons. Leave to dry then use felt pens to draw on details. 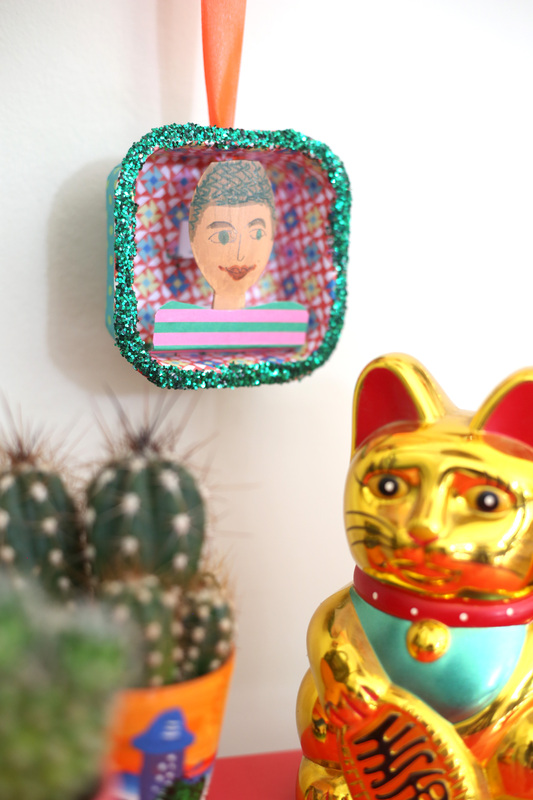 Use sticky tape to attach the portrait onto the shoulders. To keep the portrait in position cut a narrow support strut from thin card about 4cm long, fold in both ends by 1cm, then tape one to the reverse of a portrait. Stick the shoulders to the bottom edge of the tray with double sided tape and tape the end of the support strut to the back of the tray. With the point of the scissors make a hole through the top edge of the tray. Cut a length of ribbon and pass one end through the hole and tape in place. Draw a boot shape onto paper and cut out. Fold your blanket or jumper in half, then pin on the paper pattern cut out using pinking shears. Sew the two boot shapes together around the edges, wrong sides together, using blanket stitch – and remember to leave the top unstitched. There are lots of YouTube videos that teach blanket stitch – don’t worry, it’s easy! Sew running stitch around the top of the boot on both sides. Make a plait from wool and fold it in half to make a hanging loop. Sew onto the top of the boot on the side with the heel. 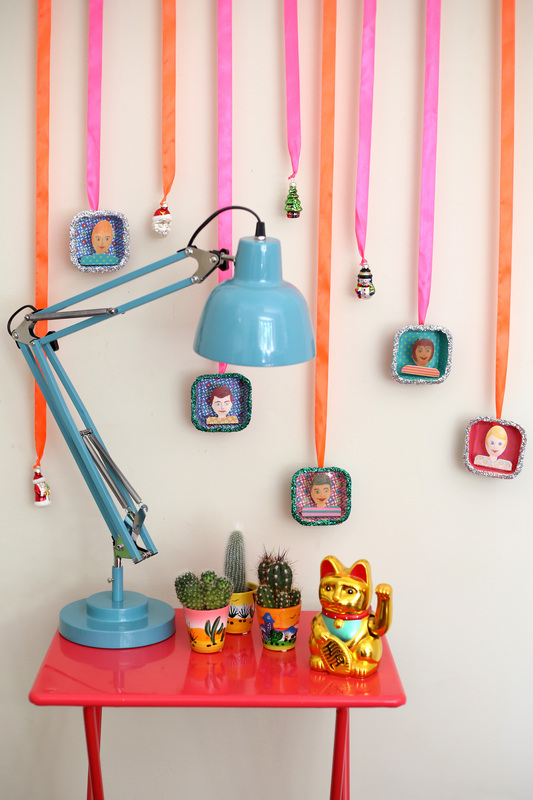 Make the pom poms (use two doughnut shapes of cardboard to do this, exactly like you remember as a kid!) 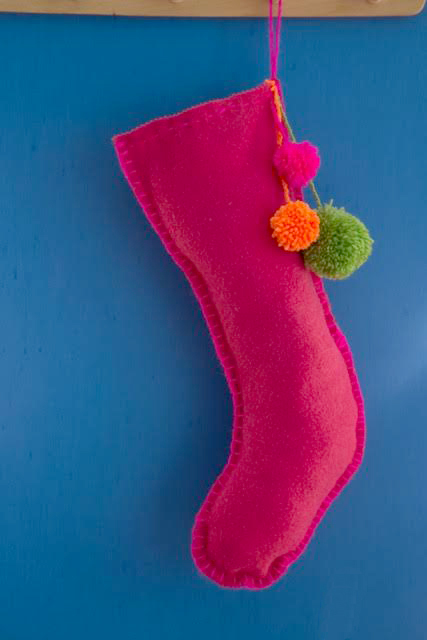 and attach to the stocking with yarn as a final flourish. 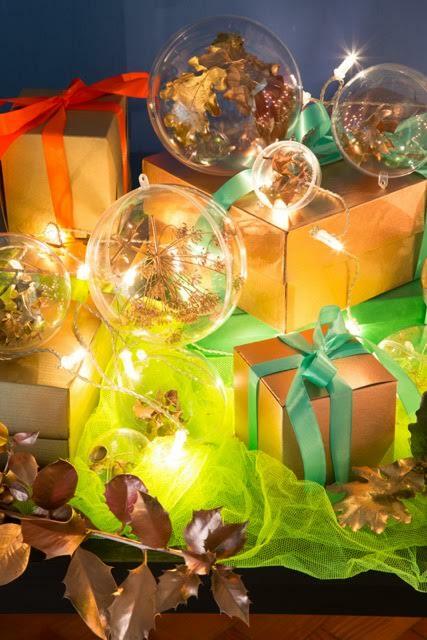 Pick your natural natural materials from surrounding hedgerows or fields (never from private land). Make a spray booth from an old cardboard box. Take the box outside and spray your picked pieces with a coat of copper paint. Leave to dry, then turn any leaves or large seed heads over and do the other side. 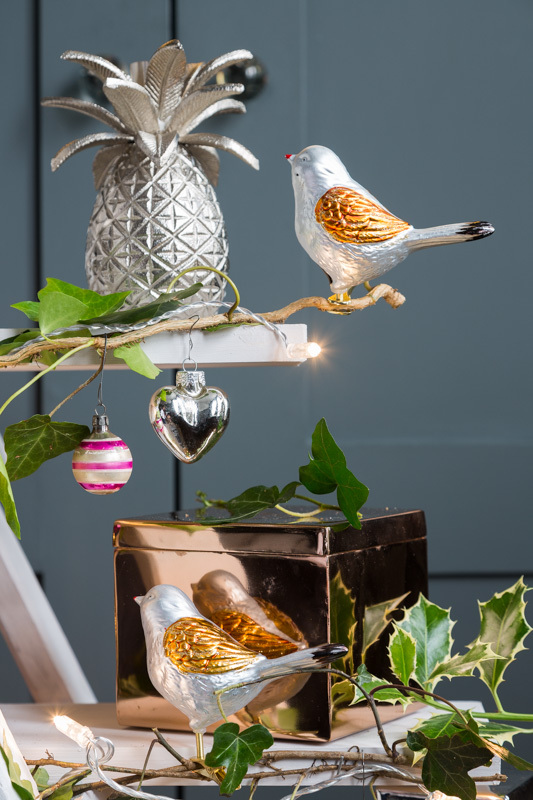 Fill the baubles with the copper-coloured decorations and tie ribbon through the hanging loop at the top of each bauble. 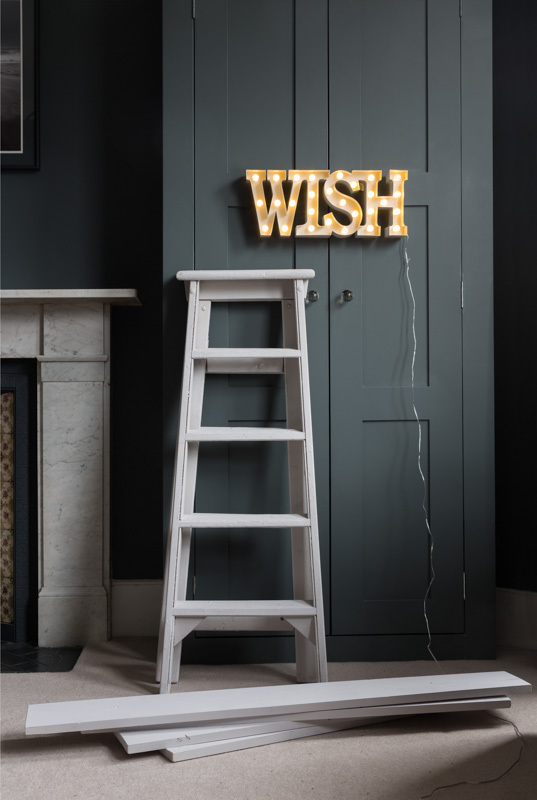 of an old ladder with near-on zero prep, using a coat of chalk paint to cover ancient paint drips and to create a matte finish. 1. Put up the ladder and decide how steep you want the sides of the tree to be; you might have to remove the retaining cord. Ours is quite broad as we wanted to max out on the display area. 2. To make the back leg shelf supports, cut batten from 2.5cm x 5cm planed timber.With the spirit level balanced on the front step, extend the level line and mark where to locate the support batten on the back legs with pencil. Screw the battens in place. 3. 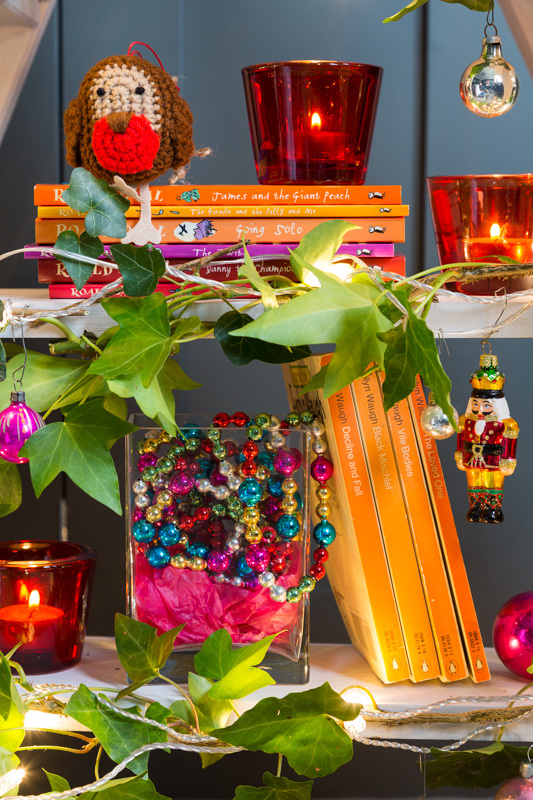 Our shelves projected 25cm beyond the edge of the step to give extra display space, but you could make yours shorter if you’d like. Decide on the length, then cut each shelf from planed wood. Screw in place on the front steps and back batten. 4. 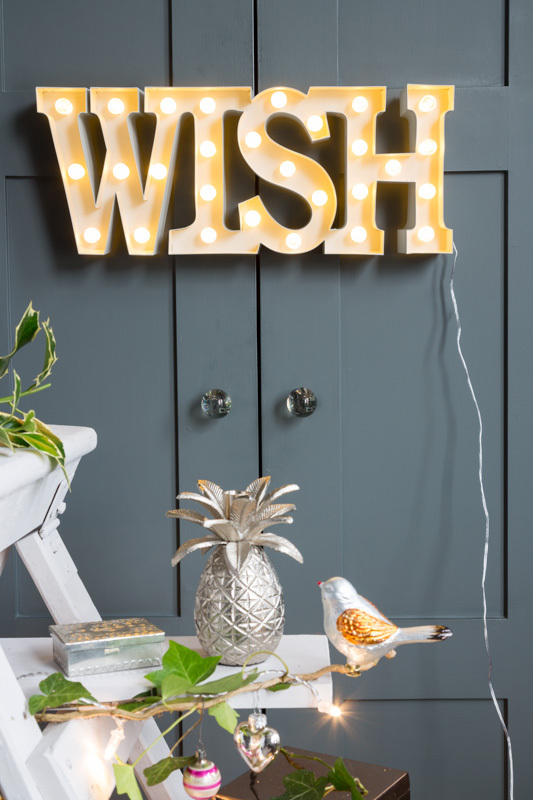 To make the chalk paint, mix 400ml Crown Cloudburst Matt Emulsion with 200ml Polyvine Chalk Paint Maker. 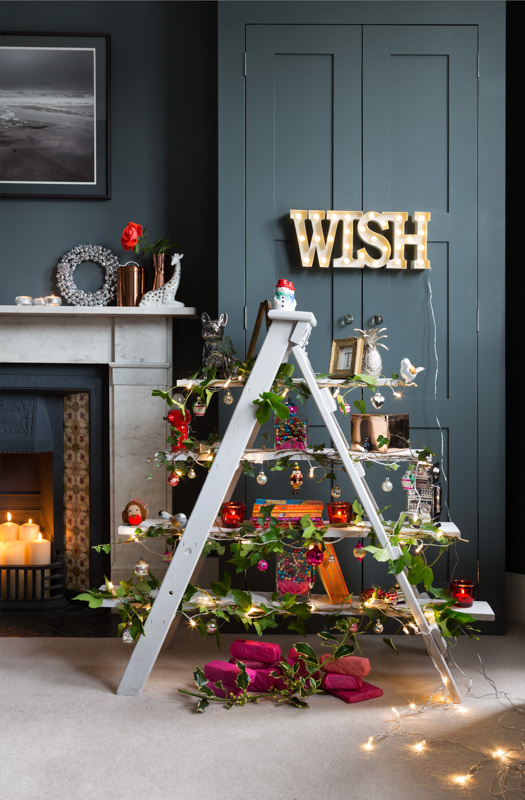 Then, with a crosshatch strokes, paint the ladder Christmas tree and let dry before decorating. Before buying the fabric, make your pattern as you to work out the amount of fabric required. Stand the basket on a piece of paper and draw round the base. Cut out the shape and place it inside the basket. Press it firmly down into the bottom and using a felt tipped pen draw a line round it just inside the edge to mark where the base of the basket joins the sides. This line will be your sewing line. Measure the height of the basket at the highest point, add 15cm for frill and 2cm seam allowance. Measure the circumference of the basket and double the length and add 2cm for seam allowances. Make a rectangular pattern of the dimensions you have just measured. Lay all the pattern pieces side by side to work out the amount of fabric you need. Remember to allow for 34 triangle piece to make 17 finished triangles. If you are making a mattress cover, and coverlet you will need to make a pattern and measure for these at the same time. The pattern cut for the base of the lining can be used for the mattress, if you are making your own. Mattress cover – Lay the paper on top of the mattress and draw round it. Lift up the mattress and add a further 10cm all round the shape just drawn. Cut round the outer line to make the pattern. 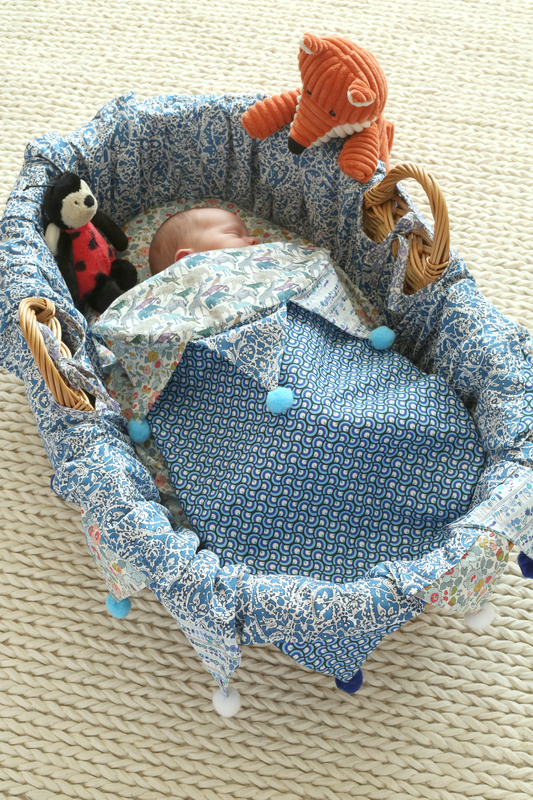 Coverlet – Make a paper pattern using the crib base as a guide but add a further 10cm all round. Cut 6 more triangle shapes to make up three triangles. Making up the basket lining use 1 cm seam allowance through out. Pin the pattern pieces on to the fabric and with the exception of the triangles cut one of each shape. Cut 34 triangles. With right sides facing, stitch the short sides of the rectangle together. Using long running stitches, gather one of the long sides. With right sides facing, ease the gathered edge onto the edge of the base. Pin into position and then machine. Put the lining into the basket. Mark the position of the handles with pins and then cut the fabric between the pins. Neaten the raw edges with bias binding. Cut 120 cm of bias with wrong sides facing fold in half lengthways and sew to make a ribbon. Cut 4 pieces each 30cm long. Sew one of these ribbons to the wrong side of the centre of each side of an opening. Tie them to create a bow. Make up the triangles, with right sides facing stitch two pieces together down two sides. Trim the seams and the corners. Turn the right way out and press flat. 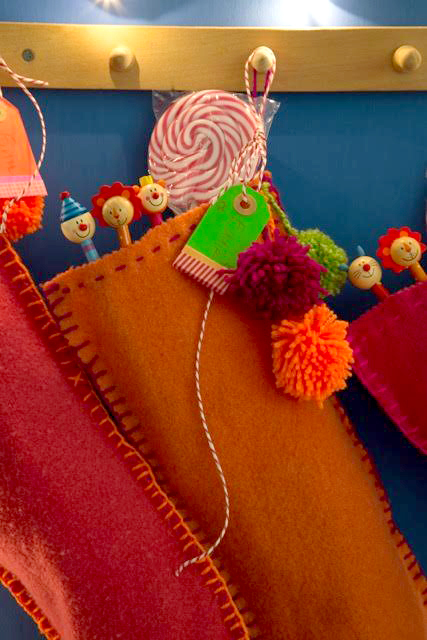 Turn under the top edge and pin and sew evenly round the edge of the lining.Sew pom poms on the end of each triangle. Using the cut pattern for the base of the lining, cut three layers of wadding and two of fabric. Baste the wadding together. With right sides facing, sew two pieces of fabric together round 3 ½ sides. Insert the wadding and close the gap by oversewing. 1.Using the mattress cover pattern, cut as many covers as required. Turn under by 2mm all round to neaten. 2.Sew bias round the edge and then again making a channel for elastic. Leave an opening to thread the elastic. Place over the mattress and tie the ends of the of the elastic so it covers firmly but not too tightly attached. Cut 1 top fabric, 1 bottom fabric, 1 wadding, 6 triangles. Make 3 triangles as you did for the basket Making sure triangles face inwards sew them along one short side of the quilt. With right sides facing, sew the lining fabric onto the top fabric around 3 sides. Trim the seams and corners, turn the right way out, press and close the opening by over sewing. Add pompoms to the ends of the triangles. Our sewing machine came with a less than elegant flimsy fabric cover. 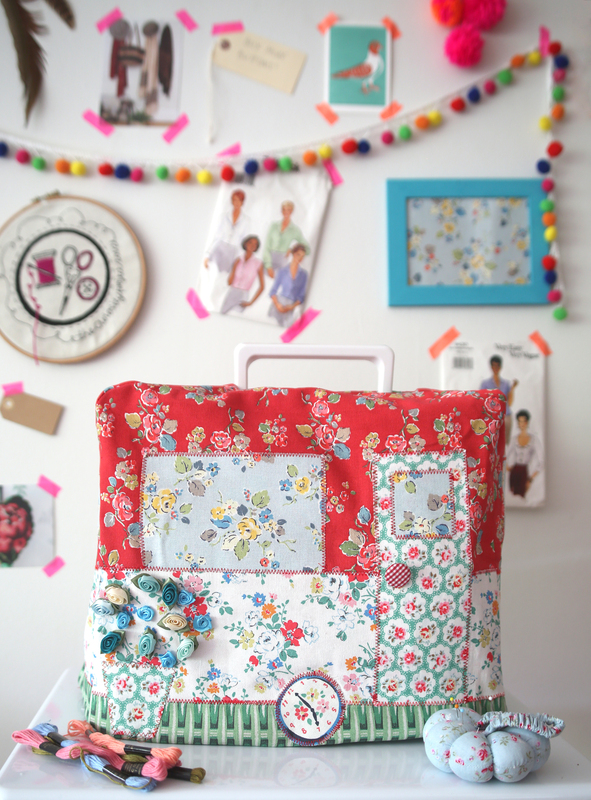 What better way to use up some of our Cath Kidston fabric stash than designing and making our own unique cover. We used the fabric cover that came with our machine for our pattern template, use our pattern only as a guide and take measurements from your sewing machine for a good fit. Measure your sewing machine and draw up your pattern using ours as a guide. Pin onto outer and lining fabric and cut out. Trace templates for windows wheels etc onto the paper backing on the bondaweb. Cut out bondaweb shapes and iron onto the reverse of the fabric you have chosen for the fabric shapes. Peel off the backing paper, then place the shapes in position and iron to fuse. Sew zigzag stitch around the each shape to anchor. Sew on the button door handle and ribbon roses. Pin and sew the outer cover and the lining. Turn the cover right sides out push into the inside out lining. On the top section of the cover pin the lining and outside together then pin the template for the handle opening in place. Sew through the paper template round the edge of the box shape, then tear off the paper. Using embroidery scissors cut the fabric along the centre of the box shape, cutting diagonally into each corner. To turn the cover right sides out push the lining through the opening you have just cut. Ease through then press the seams of the opening. Pin the lining and outer cover together along the lower edge, trim the lining. Turn the raw edge of the outside cover in by 1cm, then turn again by 1cm and hand sew in place. 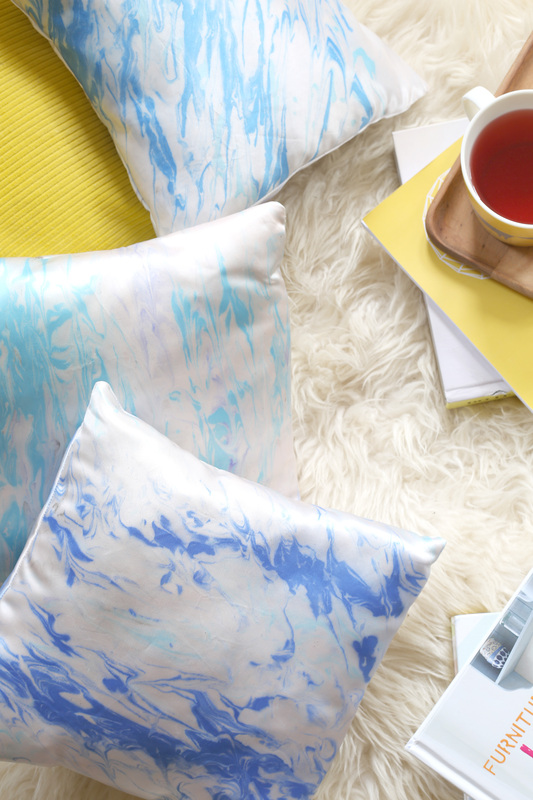 Recently we found an ancient, well 1990’s Dylon leaflet about marbling on fabric and so intrigued were we that we decided to create a marbled cushion. Traditionally marbling was done on paper and was achieved by floating oil colour on water or size. If you try and do this on fabric, the fabric feels hard and unpleasant. Did a few experiments on different kinds of cloth and the ones that give the best colour and luminosity are Silk and Satin. 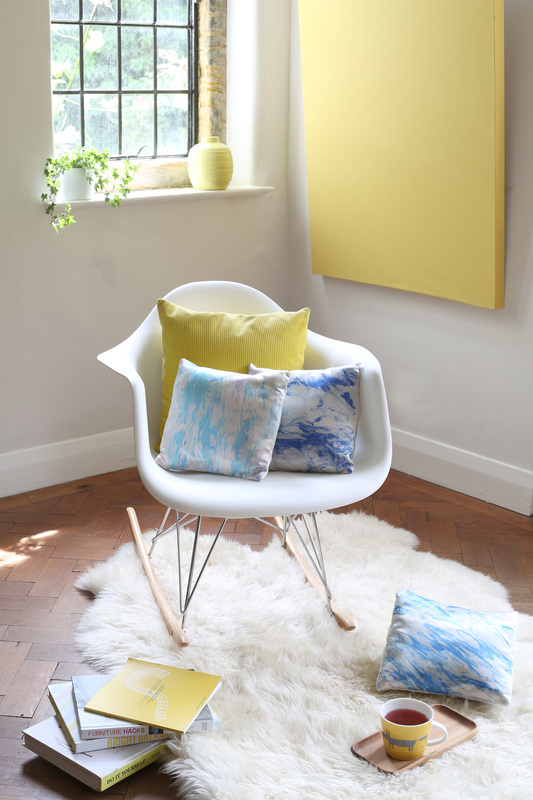 We have used a heavy slipper satin for these cushions. For best results use a white or light coloured fabric. Put on your gloves to protect your hands. Whisk the wallpaper paste into water according to the manufacturers instructions, until it is the consistency of yoghurt. Pour into a shallow trough until it is almost full. Leave to stand for at least 15 minutes. Tip: Whilst you are waiting for the paste to set, use the time to cut your fabric so it fits in the troughwith enough border to lift it in and out. Cover the work surface in newspaper. Apply drops of colour onto the surface of the paste and then use your tool to swirl them around. This can look pretty messy at this stage. Carefully lower a piece of fabric onto the paste surface. Leave for a few seconds for the paint to absorb, you may need to push it down with your fingers. Carefully lift off the fabric. It will be covered in paste as well as a pattern below the paste. Leave on a work top for at least 5 minutes. Wash off the paste from the fabric under running water. Leave to dry. When dry, iron the fabric o the back, using a hot setting for 1-2 minutes to set the colour. Tip : To clean the paste between applications use a spatula to remove the surplus colour. Cut two further pieces the width of the cushion cover by approximately 2/3 the length. (29x 20cm) For the cushion back. 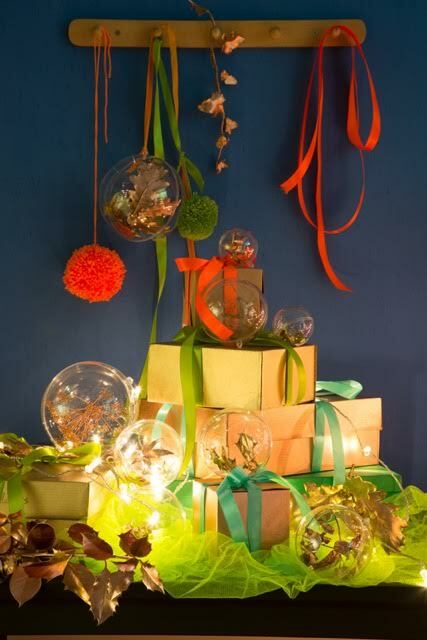 Ooh lush colours from #Dulux here, our favourite orangey reddy coral going on there. Paint dontcha just love it for a transformation, whats your favourite colour?